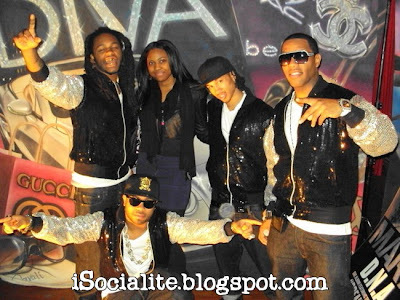 I recently got the chance to interview Spectacular from Pretty Ricky tha nks to their manager, who is a pretty good friend of mine. One thing I can say about these boys is that they have the best team working behind them. I touched base on a bunch of different topics. The transcript is after the jump. I advise you to listen to the audio if you're in the mood for a laugh. He is quite the comedian. I think their personalities come through in everything that they do which definitely helps boost their already massive fan base. I love them, and you should too. iS: First off, tell us a little about you. Spec: I mean I just like to…i’m a real low key person. I don’t really like to do nothing out of pocket. I just like to chill. Probably go out to eat or a movie every now and then. I just like to have fun at the end of the day. I’m a simple person at the end of the day. I like to have fun, I like to put a smile on people’s face. If you happy, I’m happy. iS: Have you guys started working on your next album? Spec: Yeah, we just started working on the new album. Also we have a song with Jodeci and H-Town we just started. They working the record right now. So be expecting that soon. But ya’ll make sure you get this new Pretty Ricky album in stores right now. Forget the one we working on. Worry about the one in stores right now. Get the Pretty Ricky album, support the boys. If ya’ll watching 106 & Park, ya’ll make sure ya’ll vote that video on the 106 & Park countdown. iS: Besides Jodeci and H-Town, are there any other collaborations that you guys got in mind? Spec: Uhm, a lot of people hollering at us. I don’t really know at this point. But a lot people hollering at us. Snoop hit us up. Snoop said he might jump on a record with us. Day 26 hit me up the other day, just yesterday. I mean a lot of people. So, it’s going down. iS: You guys get a lot of female attention when you’re on tour, so how do you handle all of that and stay focused at the same time? Spec: I mean basically we just stay focused period. At the end of the day its all about work. You just got to stay focused. Gotta keep your mind on the prize. The prize is money, money is the prize. The prize is going out there and doin’ ya thang. That’s how you get that money. So your money and the prize, its all about the streets and them sheets…that aint make no sense at the end, but I heard it on a pimp movie yesterday..DYNOMITEE! iS: What was it like on the BET tour with Fabolous and Mario..you guys were on there when Trey Songz and Day 26 were on there too right? Spec: Uhm, nah. We wasn’t on there when Day 26 and them was on there but we was on the second half of the tour which was just like you said Mario, Fabolous, and Pretty Ricky and Mishon. It was a lovely experience. I’m cool with all them boys, Fab, Mario. Us and Mario go way back, like Braid My Hair. We been cool peoples. It was fun, bringing back memories. iS: So, are all you guys single then? Spec: Everybody single, well Baby Blue, he dating KeKe Wyatt. iS: What is your ideal wifey? Spec: Just somebody that can take care of a man. Somebody that’ll be they self at all times. That don’t try to be something that they not. That’s all I care about. iS: That’s all I got, do you have anything else you want to add? Spec: If anybody watching this ya’ll make sure you hit us up on Twitter: Twitter.com/RealPrettyRicky. MySpace.com/PrettyRicky, or you can hit us on our cell phone number (305)-600-3432. Hit us up, Facebook.com/officialPrettyRicky. If ya’ll ain’t get none of that you can just go straight to PrettyRicky.com and everything is on there. It’s Pretty Ricky baby! And tonight it’s going down. Every weekday we stream live on PrettyRicky.com. We got our own reality show online. You get to interact, callin’ up. Hit us on the chat line and we shout ya’ out, stuff like that. Go to PrettyRicky.com and hit the bottom on the TV on the home screen and ya’ll get to watch every day at 8pm. --Click here to download their music on iTunes! You heard the man, go get that album!! We did this via Skype, which was an adventure all in it's own, here's the link on YouTube.